North Koreans walk in downtown Pyongyang on April 18. North Koreans wave as they march next to a float display of models of different missiles across Kim Il Sung Square in Pyongyang. 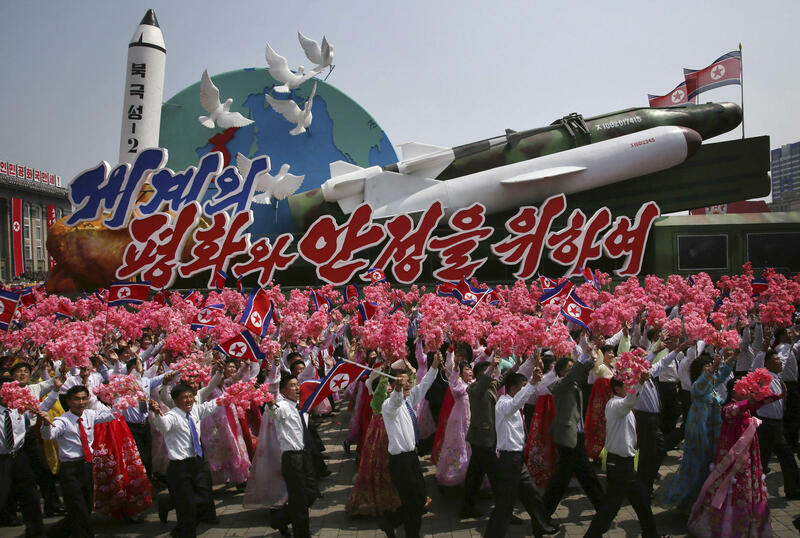 The military parade celebrated the 105th birth anniversary of Kim Il Sung on April 15. With the backdrop of tense relations between North Korea and the U.S., Lee spoke with All Things Considered from Pyongyang about what life is like in the North Korean capital these days. On North Koreans' reactions to political tensions with the U.S. It's amazingly calm. You would be surprised at how calm things are here, and I have to say that like most North Koreans, I've been largely cut off from the screaming headlines that we've been seeing. I didn't have Internet access for several days. And, as you probably know, most North Koreans don't have Internet access. They get their news from their own state media, so unless they read about it in their own state media, or see it on the evening news, they're not very aware of it. To be honest, it's remarkable, we are not seeing people who are preparing for war. They've had a month, really, of some big anniversaries. They celebrated May Day. I did go to a May Day celebration in the park, where they were singing and dancing and drinking. But they're getting ready now for a busy season of rice planting in May, so they're gearing up for that. They are completely unfazed, it seems, by all the rhetoric that we're hearing overseas. I have to point out that I've only been in Pyongyang, which is the showcase capital. This is a city of elites, and so I'm only getting that side of the picture. It's like only going to Manhattan, rather than seeing the rest of the United States. That said, it's surprising given what we hear about the sanctions how things have progressed. Everybody has a smartphone — sometimes two. Everybody is on their phones. They're all playing video games. They're doing what we do with our cellphones as well, they're checking the news, messaging their friends. There's quite a bit more English, which is interesting. English is the main language that children learn here. There's certainly a lot more cars, which is surprising given the concern about fuel shortages. I did some shopping today ... and it's just amazing the kinds of products that they have on the shelves. [That] certainly wasn't the case when I started coming to North Korea. So, in some ways, life has improved for the people of Pyongyang. That said, I think that things are still incredibly difficult in the countryside. They have a chronic food shortage, and that's only going to get worse, of course, with the tightened sanctions. I saw so many varieties of potato chips, varieties of canned goods, what would be their equivalent of Spam, for example, but all kinds of things — computers, tablets, PCs — all kinds of things that you might not expect to see in a country that is still very poor. I'm certainly familiar with [the case of Tony Kim]. As a Korean-American, this is something that anyone who comes here on a regular basis would be paying attention to. But the North Koreans didn't hear about it until earlier this week when it was reported in their state media. So it certainly was something that we discussed as a group with our North Korean guides, was the first that they had heard about it. And we don't really have a lot of details, and so we'll certainly be waiting and watching to see what he is being accused of. They have a very, very exhaustive penal code, and it is very easy to break those laws, and that's what makes being here dangerous for anyone. All Things Considered producer Matt Ozug and digital producer Maureen Pao contributed to this report. Consumers in North Korea can now buy a local version of Spam, not to mention Oreo-like cookies from Vietnam. And in the capital Pyongyang at least, everyone's looking down at their cell phones. These are things that journalist Jean Lee did not see five years ago when she opened the Associated Press bureau there. She's now a global fellow at the Wilson Center. 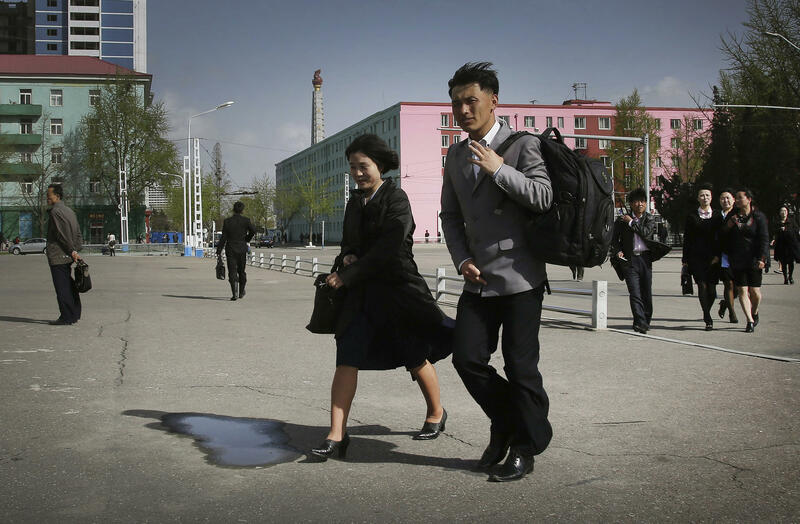 And we reached her today in Pyongyang, where she's attending a medical conference. JEAN LEE: I was invited to observe and attend this medical conference but mostly to follow this amazing team of Korean-American surgeons who are here to carry out operations. So I was very curious and wanted to get inside some operating rooms. And that's what I've been doing here in Pyongyang this week. SIEGEL: And I should explain that Jean Lee is not whispering for the purposes of secrecy. You have laryngitis, and we're being solicitous. For months since the start of the Trump administration, it seems tensions have been escalating with North Korea. President Trump told China to solve North Korea or he will. And today, North Korea accused the CIA of plotting to assassinate Kim Jong Un with biochemical substances. How are people reacting to all of this over there? Is it duck and cover? JEE: It's amazingly calm. You would be surprised at how calm things are here. And I have to say that like most North Koreans, I've been largely cut off from the screaming headlines that we've been seeing. I didn't have internet access for several days. And as you probably know, most North Koreans don't have internet access. They get their news from their own state media. So unless they read about it in their own state media or see it on the evening news, they're not very aware of it. To be honest, it's remarkable. We're not seeing people who are preparing for war. They've had a month really of some big anniversaries. They celebrated May Day. But they're getting ready now for a busy season of rice planting in May. And so they're gearing up for that. And they are completely unfazed, it seems, by all the rhetoric that we're hearing overseas. SIEGEL: This being the first time that you've been back to North Korea in a few years, I wonder what strikes you? What's changed, or do things not change in North Korea? JEE: It's interesting being back. You know, I have to point out that I've only been in Pyongyang which is the showcase capital. This is a city of elites. And so I'm only getting that side of the picture. It's like only going to Manhattan, rather than seeing the rest of the United States. That said, it's surprising given the - what we hear about the sanctions how things have progressed. Everybody has a smartphone, sometimes two. Everybody's on their phones. They're all playing video games. They're doing what we do with our cell phones as well. They're checking the news, messaging their friends. There's quite a bit more English, which is interesting. English is the main language that children learn here. There are certainly a lot more cars, which is surprising given the concerns about fuel shortages. I did some shopping today. Today was a day to stock up on a few things. And it's just amazing the kinds of products that they have on the shelves. Certainly wasn't the case when I started coming to North Korea. So in some ways, life has improved for the people of Pyongyang. That said, I think that things are still incredibly difficult in the countryside. And that's only going to get worse, of course, with the tightened sanctions. SIEGEL: But when you say that there were products that you were surprised to see, what kinds of things are you talking about? And can people - can North Koreans afford those things? JEE: When you go into the stores, for example, I saw so many different varieties of potato chips, varieties of canned goods, so their equivalent of Spam, for example. I did take a picture of a Oreo knockoff called Oakie (ph) which I thought was perhaps funny for those who are from Oklahoma. But this is a product that looks to be imported from Vietnam. But all kinds of things - computers, all kinds of things that you might not expect to see in a country that is still very poor. SIEGEL: I want to ask you about a story that we and other news agencies have reported on, that's the detention of another American in North Korea. An accounting instructor was trying to leave the country when officials detained him there. Is that something that's been reported on state media? Are you familiar with it? And how is the case presented, if so? JEE: Well, I'm certainly familiar with it. As a Korean-American, this is something that anyone who comes here on a regular basis would be paying attention to. But the North Koreans didn't hear about it until earlier this week when it was reported in their state media. So it certainly was something that we discussed as a group with our North Korean guides. It was the first that they had heard about it. And we don't really have a lot of details. And so we'll certainly be waiting and watching to see what he is being accused of. They have a very, very exhaustive penal code. And it is very easy to break those laws. And that's what makes being here dangerous for anyone. SIEGEL: Journalist Jean Lee speaking to us via Skype. First, thank you so much for battling laryngitis to talk with us about things in Pyongyang, North Korea. JEE: Thanks for having me. SIEGEL: And Jean Lee is now a global fellow at the Wilson Center.